The Campaign for Responsible Rodenticide Use is keen for those who use rodenticides responsibly, and in accordance with the CRRU code, to register their companies as CRRU Supporters. 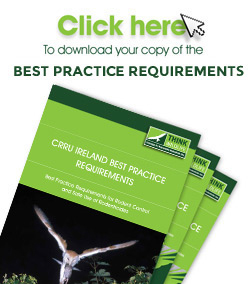 While support for CRRU does not guarantee that responsible procedures are followed when rodenticides are used, it can indicate that a company has considered the importance of the points set out in the CRRU Code and agreed to conduct rodent management operations in accordance with the Code. That code promote best practice in rodent control and help users get the best results from their rodent control programmes, at the same time as reducing to a minimum any potential harmful effects on wildlife. Registration as a CRRU Supporter does not attract charges and can be achieved on-line using the link on the right hand side of this page. The registration process requires the provision of relevant company details and an undertaking to abide by the CRRU Code. A CRRU Supporter company is permitted to display the CRRU Think Wildlife logo with their business livery, and will also have their name listed on the CRRU Supporters’ Club webpage. A CRRU Supporter will not use that status as an endorsement for any products or specific services, but rather as an indication of their desire to be seen as a responsible user of rodenticides.